Have you taken a look at the new catalogues in my side bar yet? - Just click on the pictures and you can peruse an online catalogue. Don't forget too that for every £45 you spend you can choose a FREE Sle-a-bration item. 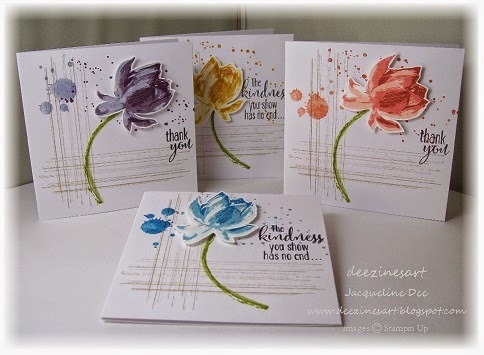 Perhaps the Lotus Blossom stamp set? This is a very simple set of three images which make up the flower. It's really easy to do too - I did this without a Stamp-a-ma-jig (stamp positioner), all you need are three colours similar in shade that go from light to dark. It works too by stamping off on a piece of scrap paper before stamping the first image. 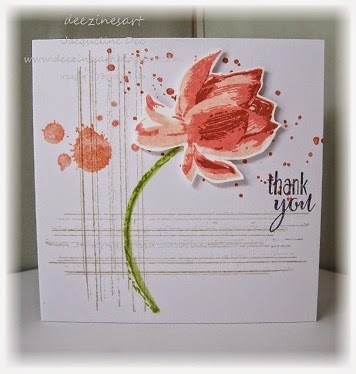 I teamed these up with the very useful Gorgeous Grunge set along with a multitude of Stampin' Write Makers.